Coming across a cluster of Indian Pipes is an eerie, almost shocking experience. Ghostly and pale in the dark of a midsummer woods, the plant’s freakish white flesh makes it look more like an oddly formed fungus than the wildflower it is. Indians Pipes are not only strange-looking but strange acting. Botanists are not certain how they survive. At first, they were thought to be parasitic – living directly off other live plants. Then they were deemed saprophytic – living off dead plants. The latest thinking, however, is that they are “epiparasite” – a parasite that forms a relationship with another parasite to get food from a host. In this case, a fungus connects the roots of the Indian Pipe to a nearby plant, transmitting essential nutrients. That’s why the pipe is white and leafless. It doesn’t need chlorophyll for photosynthesis, and it doesn’t need leaves, the food factories for most plants. 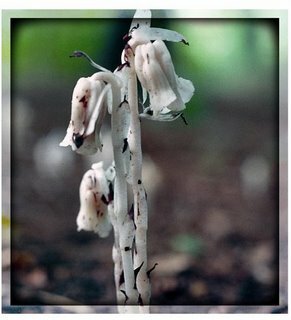 And that’s also why, when most of summer’s flowers are aglow in the fields, you’ll find Indian Pipe hiding in the shadows, deep in the woods. I've always enjoyed finding the white Indian Pipes. This year there seems to be more.. maybe all that rain. Also, for the first time I have seem white pipes with reddish color in them. I have photographs. Perhaps they picked up some color from an underground fungus? I also saw, but was too slow with my camera, a bee looking for pollen at an indian pipe. A link to Wikipedia photo of red tinted Indian Pipes. A photo of mine shows even more color. You may have seen a Pinesap (Monotropa hypopithys), not an Indian Pipe (Monotropa uniflora). The Wikipedia picture is definitely Pinesap. However, it is definitely possible to have an Indian Pipe with pinkish flesh.